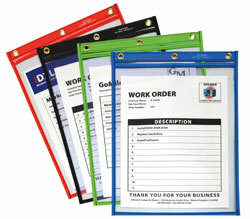 Heavyweight, durable vinyl envelopes keep contents safe and secure. Protects against dirt and moisture. Perfect for operating manuals, industrial documents, insurance policies, credit cards, passports, and more. Sealed on 3 sides with thumb cut for easy access. 5 x 8. Without flap. Vinyl envelopes are packed 50 envelopes per box and prices shown are per holder. Please order in multiples of 50 envelopes to receive complete boxes. Learn about the wide variety of shop ticket holders at C-Line..